Aye, just come back from Biggar and settling well there. Just beginning to lie properly here at Rachan, south of Broughton. Shuggee will be pleased. Aye Pete white over here now. Well pleased. Covering on the flagstones was the last to submit. Radar packed full so going to be an interesting event. Snow billowing down here at 0.9/-1°C. I suspect many folk across central belt above 150m going to get this now. The heavier rain has just started here. Temp fallen from 7.4-5.3°C in an hour there. Dew point 1°C. Going to be interesting to watch this depression take shape and pull the ppn around itself. 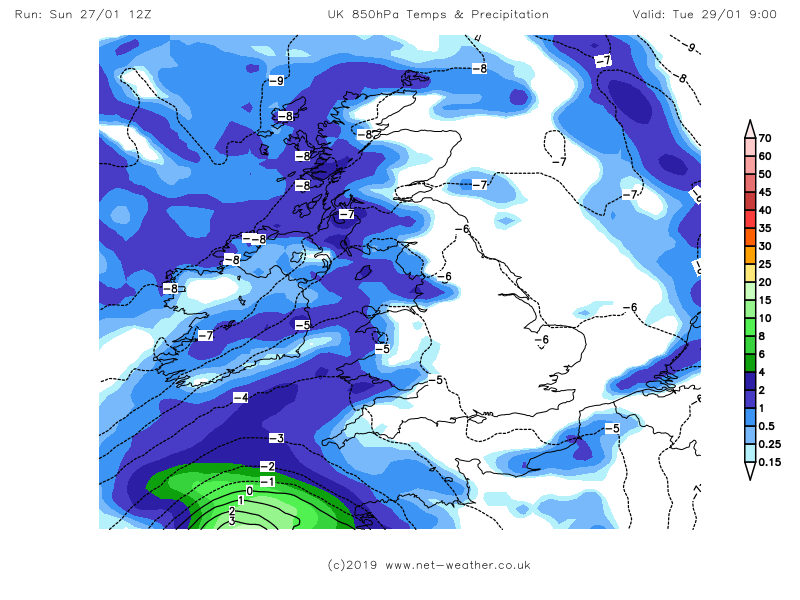 Various models predicting 6-12cm of snow for me after dark so Freya might become my favourite of the season so far. Very interesting I am surprised I managed a lower minimum than you, similar on the air frosts but slightly different on the rainfall, amazing the differences in a short distance between my location and yours, the winter was a strange one and arguably a forgettable one too apart from the record breaking warm temps late on. 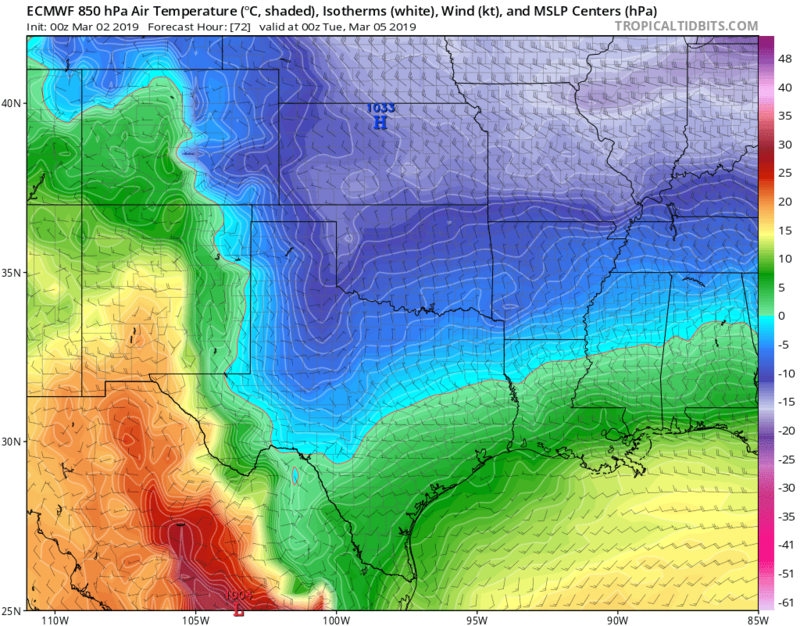 Behind the cold front, cold air will sweep over South Texas. 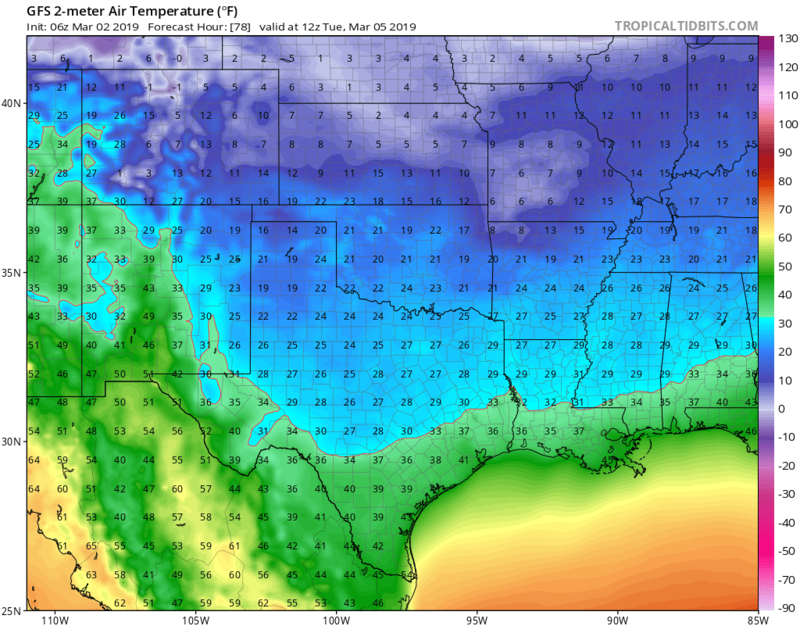 Temperatures will be in the upper 30s to near 40 degrees, and it will feel like it is near freezing. Even on Tuesday, temperatures don’t change too much, so get the winter coat ready!" Well various models have my location getting 8-16cms from 19h00 tomorrow. I wonder if it'll be enough to squeeze my seasonal snow day count into double figures. I'm almost smelling anticipation...! 6°C over the Beef Tubs this afternoon. Pouring rain followed by dry n bright. Lovely spring like lunchtime in Peebles. Sun splitting the sky. Is it April already? Radar starting to look interesting for a few in here tonight. a big blob coming into the borders could this turn to snaw? also see some snaw showers across other areas as well. 2.4/1°C and we've had some "sleetyness" so far.... Not holding my breath. Went outside and lo and behold it is there - in white polyethylene bags which had been camouflaged by the snow! Easily the coldest night of the wInter so far at -8.3°C. Snow finally reached here. Good ten minutes of steady snow back to heavy snizzle now. Not bad. Minus 6 here now. Been baltic all day. A Mediterranean -3C here on the hill. Mysteriously cloudy mind. Very cold, temperature currently -13.5c around the house. Pic taken at Whitehouse Aberdeenshire. You need to get fuel!!! Brrrr. Coldest reading in the car at Lamancha/Leadburn -10.5C coming into town. It's even -6C in north Edinburgh just now with the freezing fog just descending. Wee bit snowy in South Lanarkshire just now on the drive home. Fluttering down in Biggar with much excitement in the co-op. 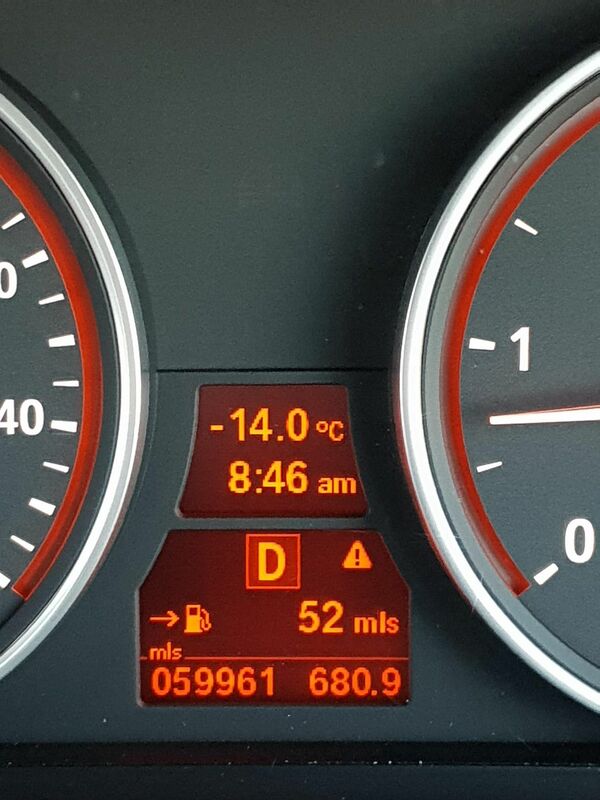 -6.5C driving in. No snow by us but sparkly! A week of a few surprises coming-up me thinks. 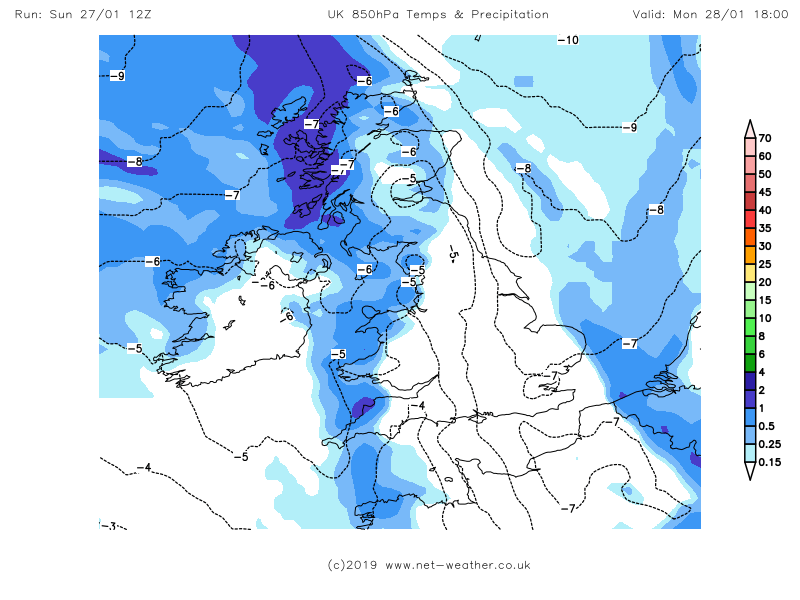 Various models still throwing out interest for the western half of the central belt and south west Scotland Monday night through to Tuesday afternoon. Still difficult to call, definitely down to watching the radar I think. For the end of the week, very up in the air, corrections in all directions at the moment.